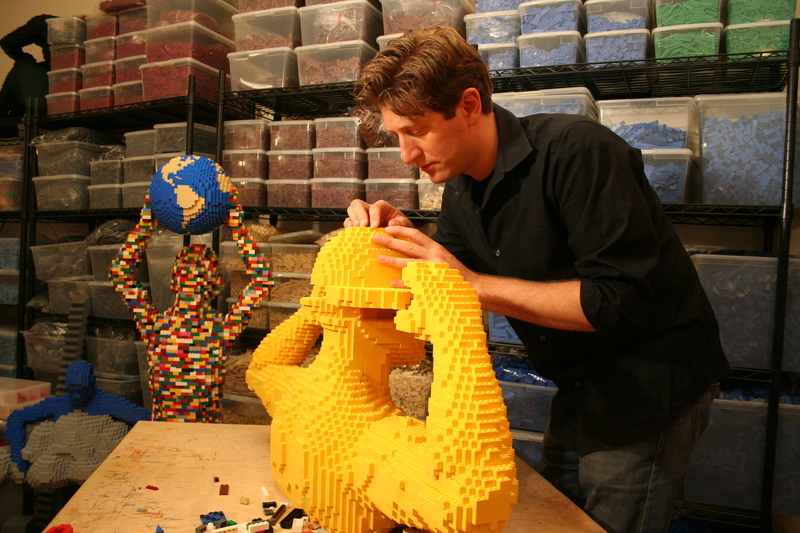 Nathan Sawaya has the job that every kid dreams of having. He’s a LEGO Artist, a Certified LEGO Professional. What does that mean exactly? It means he spends his days in his New York studio building awesome things out of LEGO. A casual scroll through his website reveals things like a LEGO replica of Stephen Colbert; a scale model of a Blackberry with a working screen, a giant set of LEGO milk and cookies, an anatomical heart, a life sized cello, a portrait of Abraham Lincoln, Han Solo encased in carbonite. Pop art, but in LEGO format. How does one exactly do this sort of thing? Below, Sawaya provides his five takeaways of LEGO. 1. LEGO can take you anywhere. “Since becoming a Lego artist, I have put together museum exhibitions and gallery shows all over the globe. I have been asked to send sculptures to Hong Kong, Dubai, Paris, London, Singapore, even Kansas City. 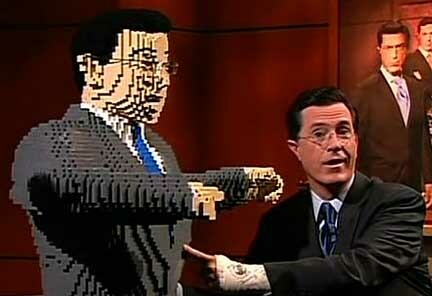 I never dreamed that creating with LEGO would take me to places like Hawaii, Stockholm or Appleton, Wisconsin, or even as a guest on the The Colbert Report and Mythbusters. I got to design a LEGO room on Extreme Makeover: Home Edition. And weirdest of all, my LEGO artwork actually became a category on Jeopardy!” he exclaims. 2. There is no such thing as cheating in LEGO. “I don’t know how many times folks have come up to me and said ‘Are you gluing your bricks? Well that’s cheating!’ And I wonder to myself, ‘Are you the LEGO referee?’ he laments. “The thing is LEGO bricks hold together remarkably well. They are an amazing construction tool. But my sculptures are shipped around the world. And the shipping process can take a toll on any artwork. I find that museums get kind of grumpy when I ship them a sculpture and they receive a box of loose LEGO bricks, sometimes with a note reading ‘some assembly required’. So to make sure my sculptures arrive in one piece, I glue them together. This is not cheating. Anything one does creatively with LEGO cannot be considered cheating. In fact, the only way there might be cheating in LEGO is if one was to use only Lincoln Logs,” he says of the building toy made with wood that comes with instructions. 3. There is nothing that cannot be built out of LEGO. Sawaya sees infinite possibilities with Lego. “When I was a child and wanted to get a dog, my folks didn’t let me, so I built myself a dog. It was multi-colored, and of course being built out of those rectangular bricks, it was a bit boxy in places. I called it a boxer,” he jokes. “LEGO is a versatile medium. As a toy, it lets your imagination rule the day. Growing up, if I wanted to pretend to be a rock star, I could build myself a guitar. If I wanted to pretend to be an astronaut, I could build myself a rocket,” he explains. “As an artist LEGO is a great medium for creating anything I can imagine. I still use those same rectangular plastic bricks that I had as a child, but now I try and use them in a way that hasn’t been seen before. I have an entire museum exhibit touring North America that is very popular with both kids and adults, who are attracted to the idea that there is artwork that is created solely out of LEGO,” Sawaya says. 4. Having 1.5 million LEGO bricks is not enough. At any given time, Sawaya’s New York studio has 1.5 million bricks stored in it. “The LEGO company says that there are 62 LEGO bricks for every person on the planet. That means there is a pretty big group of people who are missing some bricks all because of me. As an artist, I want to make sure I have enough bricks on hand that I can build whatever I can think of, at any time. That means I have to keep an art studio full of bricks in all shapes and colors. They are all arranged by size, and are in clear plastic bins lined up on shelves based on color. Walking into my studio is a little like walking into a rainbow. I need all those bricks because who knows what I might be creating next: a life-size human form, a dinosaur skeleton, maybe even a full size boat? As I use the bricks up, I have to keep that inventory up to date, so I am ordering new bricks monthly. I don’t know if that means there are less or more bricks for everyone on the planet,” he ponders. 5. The LEGO art movement has begun. “One of the most common questions people ask me is ‘How can I get your job?’ I tell them just to go do it. I am an independent artist, and I use LEGO bricks as my art medium. It can take weeks to create a LEGO sculpture, but I’m so passionate I fall into a near-trance while I’m working and creating. Many of my works centre on the phenomena of how everyday life, people and raw emotion are intertwined. Often my art is a reenactment of my personal feelings. I am inspired by my own experiences, emotions and the journeys I am taking,” he explains. But being an artist, why did Sawaya choose LEGO as his medium? If pointillists worked with round dots and it looked like curves from afar, then the LEGO must be a cubed, three dimensional version. Sawaya is optimistic about the future of LEGO art. 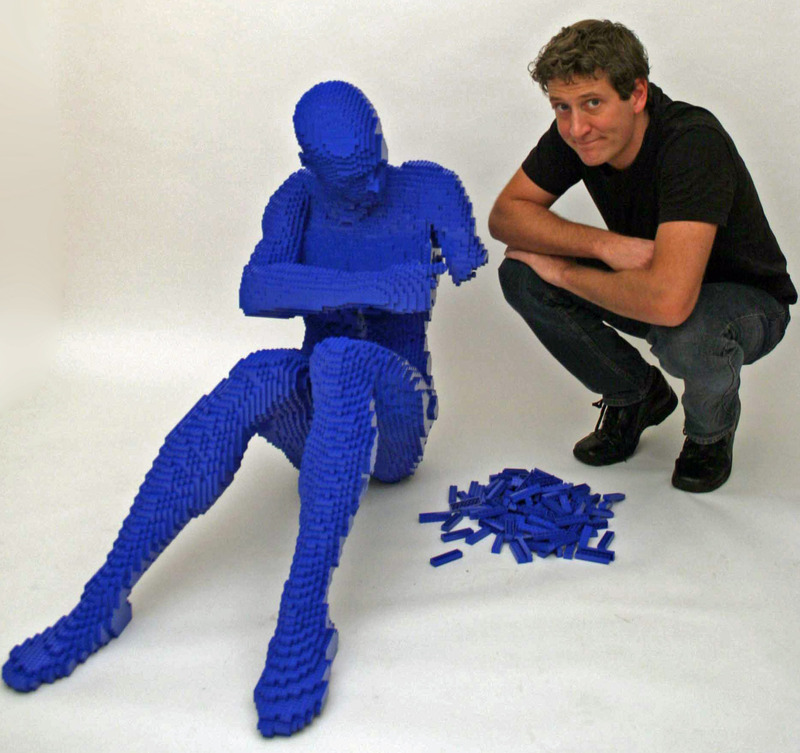 More of Nathan Sawaya’s work can be found at his website, Brick Artist.